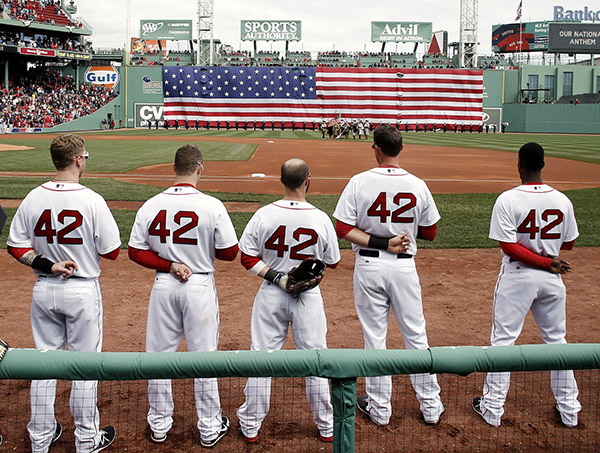 Boston Red Sox players line up for the National Anthem all wearing number 42 in honor of Jackie Robinson Day before a baseball game between the Boston Red Sox and the Tampa Bay Rays at Fenway Park in Boston Monday, April 15, 2013. Patriots Day. This Massachusetts holiday celebrates the battles of Lexington and Concord, which were the first battles of the American Revolutionary War in 1775. The day always begins with battle re-enactments. Then the Red Sox play an 11AM game, and during and after the game there is the running of the Boston Marathon, a race that first ran in 1897. There are always lots of photojournalists working in and around Boston on Patriots Day. This year it fell on Monday April 15, 2013, and it also included celebrating Jackie Robinson Day at Fenway Park and ballparks across the country, with every player wearing number 42. The Red Sox celebrated a bottom of the ninth walk-off win just eight blocks from the finish line of the Boston Marathon. The real story of the game was not so much the walk-off-win by the home team, but the celebration of the first African American man to play in the Major Leagues. Being assigned to the baseball game that day I knew that being sure to photograph multiple players in one frame wearing the number 42 became the most important picture of the game, and combining it with something patriotic to commemorate Patriots Day would be a bonus. Well before I even got to the ballpark, I knew that was the picture I needed to make that day. It was a sunny day, so I did all my cropping and toning underneath my GriffGear laptop screen shade- a quality, durable and compact screen shade made in Australia. Forty-five minutes after the game ended, I was just finishing filing the last of 48 pictures from the game, which included 22 for the wire and 26 out takes which go directly into the archive. The Boston photo editor told me that “people were maimed” at the finish line of the Marathon and I was directed to head there right away. He said nothing about a bomb, two bombs, or anything else, because initial information was sparse. That is all the information or direction I received from my editor all day. Cell phone’s didn’t work around the ballpark due to the shear volume of calling and texting about the bombings, and around the finish line all cell phone communication was cut for fear of them being used to trigger another bomb. As I was leaving the ballpark, word on the street began spreading that bombs went off at the finish line. That information, combined with the never-ending sound of the sirens of emergency vehicles, started to paint the picture for me. The five minutes it took for me to get from Fenway Park to the area of the finish line was enough time to formulate a plan in my mind before I got out of the car. So, just like the baseball game, I arrived near the bombing scene already knowing the kind of picture I needed to look for. Considering the technology of cameras we use today, knowing what the picture is can often be the bigger challenge than actually making the picture. Without be able to communicate with any editors or photographers, this was the way I thought out what I needed to do: I knew my wire service had several people covering the finish line and I knew that, considering the scope of what had happened, that getting anywhere near the blast sites was not going to happen. But that did not frustrate me. I knew those extremely experienced photographers we had at the finish line were going to take the responsibility for the pictures in and around the blast sites (the scene, the injured, the rescuers, and the responders). So, instead of running around wildly all over the area taking pictures, my plan was to locate the spot where runners who had finished or who were taken off the course before they finished were meeting up with their loved ones. Surviving the incident was now part of the story. I left my car with two EOS 1D X’s, with a 400 mm lens on one and a 20 mm lens on the other (I also carried a flash and several other zoom lenses with me). I was either going to be able to get right amongst the runners or I was going to be kept a ways away, so I planned for both. As I suspected, the block and a half away from the blast sites were completely off limits to everyone- and the cops were not screwing around. They were very concerned about more secondary explosions, which are a common terrorist tactic. Here was my first chance at a picture, the police directing people away from the blast sites. One block further away on Boylston Street (which is the street the finish line is on), I found the busses that all the runners were to get on after they finished the race. This was the spot I was looking for. Here I found people holding signs with the names of runners they were looking for, runners being reunited with others they had run with, runners being reunited with family and friends and people basically walking around with that blank, lost look on their face. There were potential pictures everywhere. Two thoughts crossed my mind at this point: One was that with pictures everywhere, it kind of reminded me in a weird way of the moment a team wins a championship. In that case there are pictures with different emotions all over the court, field or rink. The problem now was where to find that one storytelling picture that we all look for at the end of any emotional or championship event. My second thought was that this was an obvious place for a secondary explosion, and I needed to be aware of the surroundings. A long row of porta johns caught my attention as an area to avoid, and I made myself aware of the locations of mailboxes and trashcans. It seemed sad that in this country, I was in a place where I had to be concerned about these things. And it’s just my own belief, but I’ve always felt that no picture is worth dying for. 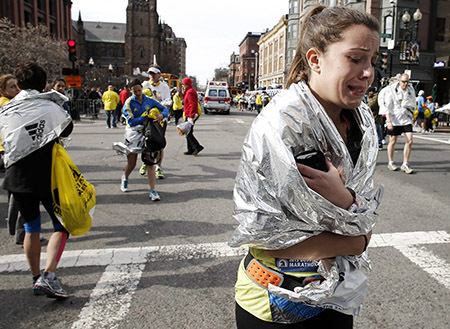 An unidentified Boston Marathon runner leaves the course crying near Copley Square in Boston Monday, April 15, 2013. It was at this point that I was now basically using two lenses: a 20mm and a 70-200mm zoom. I have stopped using a wide-angle zoom because of trouble with edges of the frame or even sides of the frame not being sharp when other parts of the frame were sharp. Trying to be respectful of the situation and not just shoving my camera in everybody’s face, I spent a large amount of time just looking and listening for a picture. That’s when I heard it- a faint crying, a kind of quiet whimpering. A young female runner all by herself, walking towards me wrapped up in a foil blanket and crying as she wrapped her arms around to comfort herself. Instead of walking towards her, I let her just walk past me. I shot about 10 frames (and with the EOS 1D X that doesn’t take long) with a 20mm lens as she passed right by me. Sometimes you don’t know how a picture will feel until you bring it up on your laptop. So, working for a wire service and knowing that a deadline is passing every second, I headed back to my car to transmit with a wireless card. The picture of the female runner crying on this page just worked, and I’m not ashamed to say that some luck was involved. It worked for me because other runners are walking around in different directions. An ambulance is leaving the scene, and the man in the red coat is holding flowers that are obviously for a loved one when the marathon was finished. This picture was just one moment in a day of thousands of moments in Boston, but it appeared on over 75 front pages of newspapers around the world, the next day, and it was a double truck in “Leading Off” in Sports Illustrated. As I said before, there was some luck involved when the different features within the picture all lined up at the same .005 of a second. But I also believe that my thought process on approaching this tragedy got me pictures on this day, just as much as my eye or the camera did. Whether you have a whole day or just a few minutes to come up with a plan, it is a necessity to think clearly, assess the situation, and approach a scene at the place where you best fit into the big picture. If I had run aimlessly around the perimeter of the blast sites, I would have wasted my time and a chance to really contribute to the story. With over 25 years of experience as a photojournalist, this approach has become second nature. If you have any questions or comments, you can reach me at wwtownson@aol.com.